Teachers do not have high enough expectations of students on study programmes. Teachers do not plan challenging learning that meets learners’ individual needs and abilities. 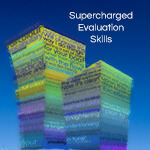 Supercharged evaluation skills is available as a half- or full-day session. Supercharged evaluation skills: Distinction level results from the start is not a Gifted and Talented programme, but a strategy to ensure that all learners can achieve outstanding outcomes. Too often, terminal success-rate data reveals a wide spread of achievement grades with too many providers struggling to produce a majority of high grades. But poor high-grade rates are not an issue – they’re a symptom of something, somewhere not being addressed. Examining the progress-rate data of many providers reveals that too many learners take a long time to begin achieving higher grades. Teachers often simply point to learners’ inability to work at distinction level, but if pushed to be specific, acknowledge that learners do not have the sufficiently developed higher-order thinking and evaluation skills needed to achieve distinction grades. If this is the root-cause of the symptom, then this is the issue to be solved. In this session, delegates consider a strategy for developing learners’ expert learning skills before the end of the extended induction period. Only then will all learners be equipped with the toolkit with which to be outstanding. Higher-order thinking requires learners to be in command of two vocabularies: the vocational and the evaluative. They also need to understand and be able to use ‘The Formula for Evidence-based Opinion’. This thoroughly scaffolded approach is naturally rooted in literacy and communication skills, helping providers to meet one of the key inspection agendas and arguably the cause of most poor inspection grades in recent years. Do you ever have learners struggle to give a strong, coherent, evidence-based opinion? Do some of your learners take months to develop the ability to achieve high grades, if at all? ‘Supercharged evaluation skills – Distinction level results from the start’ has been designed to show how to turn all of your learners into higher-order thinkers, with a strong command of both their vocational and the evaluative vocabularies to give rich, full-colour, evidence-based opinion – to never again be happy with simply saying: ‘Yes, I liked it…’, or hiding behind: ‘I don’t know’. Along with this carefully scaffolded practical strategy, delegates will also be introduced to a perhaps provocative consideration of differentiation, complemented by constant references to Ofsted’s new agenda, as laid out in the 2015 Common Inspection Framework. If you’re interested in practical strategies to transform your learners and practical strategies to avoid falling foul of Ofsted’s new trip hazards, then this session is for you. Supercharging your evaluation skills and learning about ‘full-colour writing’ is also a lot of fun. consider the negative impact of common-place differentiation strategies and set out the implications for their teaching.